Home decor is very important to me. My home is my "queendom" and styling her like a gem is supreme. One of the elements I looked for when purchasing a home was size. Because my tastes vary and align with the side of luxurious; I knew that it was important to find a large house for variety, and a favorite store for economic purposes. Z Gallerie was the perfect fit. I first became acquainted with Z Gallerie when I first moved to Atlanta. One of its locations is at Perimeter Mall which was only a few blocks from my then apartment. I immediately fell in love with Z Gallerie (and so did my mom). We were in the store for hours. The displays were phenomenal. I found the perfect arrangement for one of my guest bedrooms. The beds were opulent and the decorative accessories were a perfect match. My mom and I wanted to buy one of everything. We were both amazed with how affordable their chic furnishings were. The level of quality and beauty that Z Gallerie offers is typically very expensive in similar stores. I finished my guest room with one of their many pieces of art. 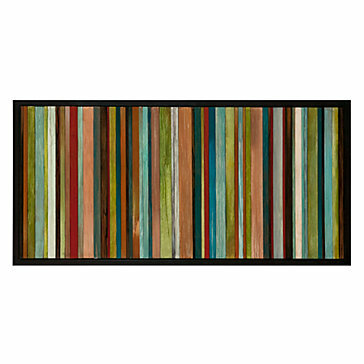 I am a huge fan of abstract pieces and Z Gallerie has them in abundance. I really liked Levels by Charlene Lynch. One of the greatest things about Z Gallerie is their online selection. If there isn't a store near you, all of their fabulous finds are online. Have you ever visited Z Gallerie? What did you think? I love Z gallerie I went into the one in midtown and saw a lime green dining room decor I fell in love. my house was featured on HGTV a few years ago, many of my things came from Z Gallerie, LOVE that store! I never visited Z gallerie but it seems a very nice place!! I've never been! Sounds like its time for a field trip..
@Kita - The one in midtown is great. As soon as I get to Atlantic Station, I head there first. @Tami - That's how I first "met" you from HGTV. I loved what they did to your house. @ RD - Yes girl. Go to either Midtown or Perimeter. Both a swell. i am crazy about decorating my house... i would love to have access to this store... too bad i'm so far, lol! One of my absolute favorite home stores! A close 2nd is Pier 1. You really can design a fabulous home from Z Gallerie. Currently stalking a mirror and a rug.